JVM210H, Tube Guitar Amp Head from Marshall in the JVM2 series. 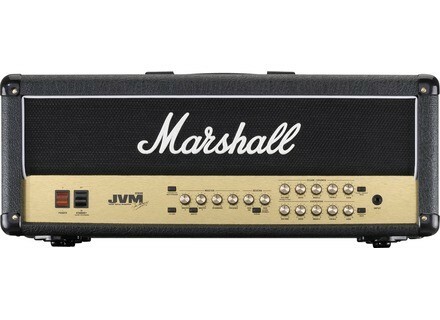 Marshall Expands JVM Series of Amplifiers with Five 2-Channel JVM2 Models. Like the JVM4 amps, these models feature two independent, footswitchable channels (Clean/Crunch and Overdrive) and three footswitchable modes per channel that are designed to deliver six distinctly different Marshall voices that range from shimmering clean to extreme, high-gain distortion. A straightforward, familiar front panel provides six LED switches and 16 controls - Volume, Bass, Middle, Treble, Gain and Reverb for each channel, two footswitchable Master Volumes plus Resonance and Presence. In addition to a Channel/Mode selection switch for each channel, the amps also feature front-panel switches for Reverb (on/off), Master Volume section (1 or 2) and FX loop (on/off). Onboard logic is designed to ensure swift and silent switching and remembers the last position of each front panel switch in all six modes - even after the amp has been powered down. Both channel/mode LEDs are tri-colored to indicate which of the three modes is selected in each channel. Marshall's intuitive, "intelligent" four-way foot-controller can memorize a player's front-panel switch settings. Five LEDs reflect every front panel switch setting, including the channel Mode being used, via tri-colored indicator LEDs for both channels. This patent-pending technology allows single front-panel switches or entire setups (Channel/Mode, Reverb, FX Loop and Master Volume switch settings) to be assigned to any one of the foot-controller's four switches. For added convenience, the foot-controller connects to the amp via a standard guitar cable. Footswitchable digital reverb with independent controls for both channels is also included. The reverb is routed in parallel and mixed with the direct signal by means of a valve. When the reverb is engaged, no degradation of the direct signal occurs, and when off, it is removed from the circuit. The reverb circuit has also been designed to avoid abrupt cut-offs, allowing the tail to decay naturally when switching or changing from channel to channel. All switching can be done via MIDI, and each JVM amp's rear panel houses MIDI IN & MIDI THRU jacks. Two FX loops (footswitchable series/parallel and parallel) and a speaker-emulated XLR output are also provided. OohLaLa Manufacturing Torn's Peaker OohLaLa's Manufacturing has released the Torn's Peaker Fuzz stompbox. Dimarzio PAF Bridge DP223 DiMarzio has announced a bridge version of its 36th Anniversary PAF pickup.